In the pre-dawn hours of the last Sunday in July, the silence on UT’s Centennial Mall is broken: “Y’all ready for this?” rapper Ray Slijngaard of 2 Unlimited asks as the synthesizer-driven psych-up song “Get Ready For This” blares near the Student Union. 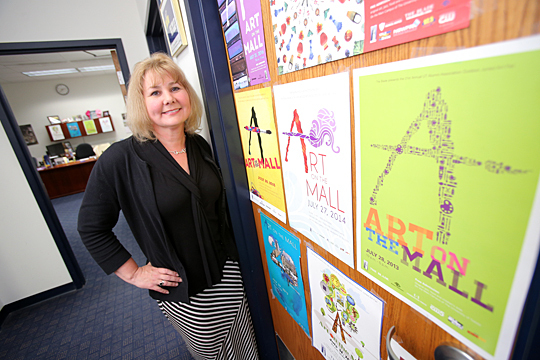 Ansley Abrams-Frederick, director of alumni programming, has helped with Art on the Mall since 2003 and directed the summer favorite since 2008. C+C Music Factory’s “Gonna Make You Sweat” is up next. 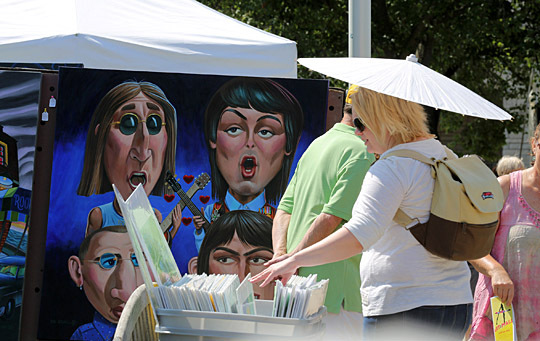 More than 100 artists will set up booths on Centennial Mall for this year’s free art fair. “Oh boy, there have been some hot ones,” Abrams-Frederick recalled. “In fact, we were joking about it. Sometimes we bring a change of clothes to freshen up a bit and change. Here’s to a sun-filled forecast for this year’s event on Sunday, July 31, from 10 a.m. to 5 p.m. on Centennial Mall. 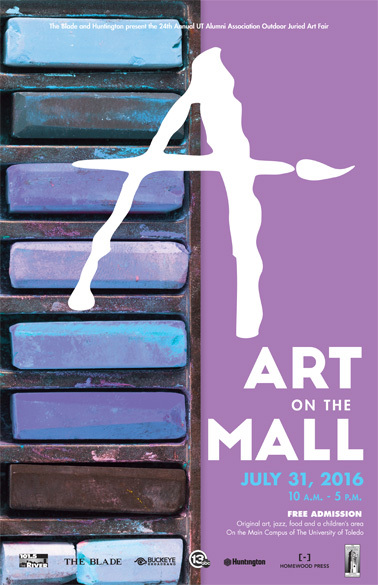 The 2016 Art on the Mall is sponsored by The Blade, Huntington, 13 ABC, Buckeye Broadband, 101.5 The River and Homewood Press. It all began more than two decades ago when participation in the UT Hole-in-One Tournament fell off. Mary Bell, former UT Alumni Association trustee, suggested replacing the golf event with an art fair that would bring graduates and community members to the University’s gorgeous grounds. She aced it. 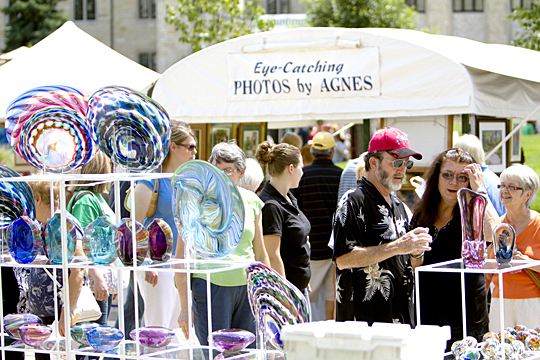 UT’s Centennial Mall is packed for Art on the Mall, which has become a summer tradition. 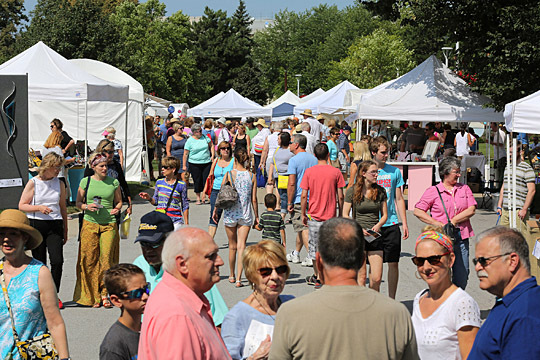 More than 12,000 annually frequent the juried art fair, where an average of 110 artists set up booths. “Centennial Mall is transformed for Art on the Mall: It’s got music floating in the air, the food smells great, you’ve got all these tents, and the people are excited, kids and families, older people — it’s a very welcoming atmosphere,” Abrams-Frederick said. And Abrams-Frederick would know: She has helped with The University of Toledo’s marquee event since 2003 and overseen it since 2008. Each year, her work on the show begins in January. That’s when artist applications become available through April, and sponsorship development starts. As the artful day draws near, co-workers in the Alumni Relations Office get in on the action, and more than 150 volunteers help make it all happen. 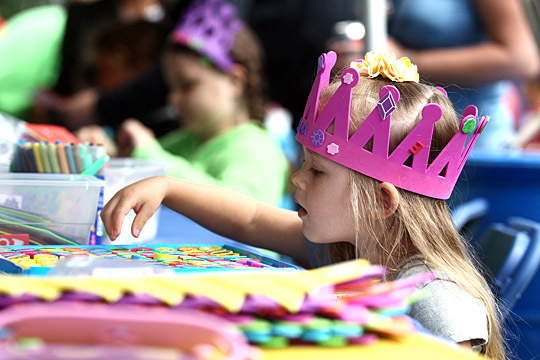 Young artists can make their own creations in the children’s area. “The diversity of the artists and the attractiveness of UT’s beautiful campus are some of the things that make this event so special,” Marcus L. Sneed, associate director of alumni relations, said. This summer will be the eighth time the 2007 alumnus of the College of Business and Innovation will pitch in. Overseeing the event has its perks. Stacy Mosetti looked at works by Mr. Atomic at Art on the Mall last year. What has she learned from running the show? “Events are fun because they change all the time. You can do the same event 10 times, and you will have different results, experiences and outcomes,” Abrams-Frederick said. “People make up a big part of that — different personalities, people’s ideas or expectations might not be the same, so there are always changes. And the one thing that it continually reminds me: You have to be able to roll with it. Everything is fluid. 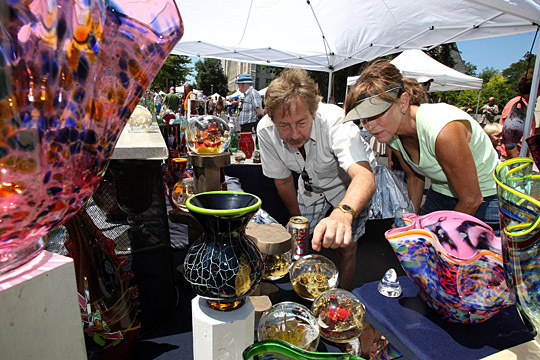 Glass, jewelry, acrylic, watercolor, woodwork, photography, oil, mixed media and more will be featured at Art on the Mall. “Centennial Mall is a living, breathing thing, and it changes — the location, the land, the shrubbery — it all changes from year to year,” she said, adding that construction projects also can pose challenges. “It’s just an adrenalin rush; it’s a long day, but it’s an awesome day. And after it’s all done, we’ve been known to actually dance in the office,” Abrams-Frederick said then laughed. This entry was posted on Tuesday, July 26th, 2016 at 3:13 am and is filed under Alumni, Arts, Events, Features, UToday .